Elard Elwynn. He's a 20 year old human Varisian from Riddleport. 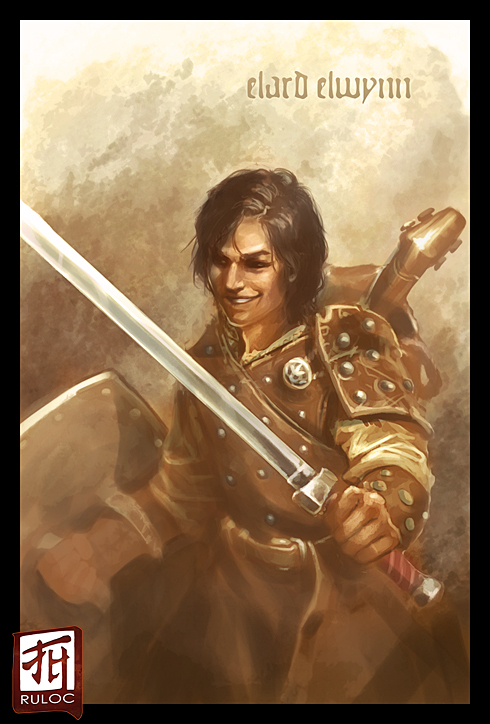 Elard has gypsy features, such as olive brown skin, wavy black hair that reaches just above his shoulders, and brown eyes. He's 5'5" and 155 lbs. Athletic build, more on the lean side than muscle head. Charming and handsome in a 'scoundrel thief' kind of way. Always making cracks at the enemy (Perform: Comedy) and chases the occasional skirt. Elard has studded leather armor, a long sword, and a heavy shield. On his back is a pack with some rope, a crowbar, and his trust acoustic guitar. Elard is the entertainer on the caravan in Jade Regent.